This is my first stab at making sense of the many Coleraine JACKSONs by using information in deeds. In the process, I uncovered several errors in my initial notes which are posted on my web site. Correcting them means totally redoing the tables, so I will update those as soon as I can get to it. Please let me know if you have anything to add or correct. PS: One helpful tool that helped to prevent me becoming utterly lost was the article by Bill Macaffe: Map of the Baronies and Civil Parishes of Co. Londonderry. PS I have highlighed a few cells in red because I plan to order photocopies of those deeds to get a complete list of townlands involved. The colour coding is a reminder to myself as much as anything. I apologize for all the repetition in my annotations, but it is done to help not only me, but also search engines to find them. This is especially important when townland names have so many variant spellings. Updated July 17, 2016. Thanks to new townland name suggestions by Linda Gilmore. Updated January 31, 2019 Links to holdings in Donegal - ROD: 45-187-28974. Coleraine Deeds – with a focus on JACKSONs in the 1700s & early 1800s. Jacksons of Londonderry. List of deeds relating to various JACKSON lines in Co. Londonderry. On my recent 2016 trip, I had only one spur-of-the-moment day available to explore Coleraine. I was hoping to find the parking lot where Jackson Hall had once been, or least to score a photo which I could use in this post. No such joy. Unfortunately, all the Museum staff were out and about, preparing for some big event. 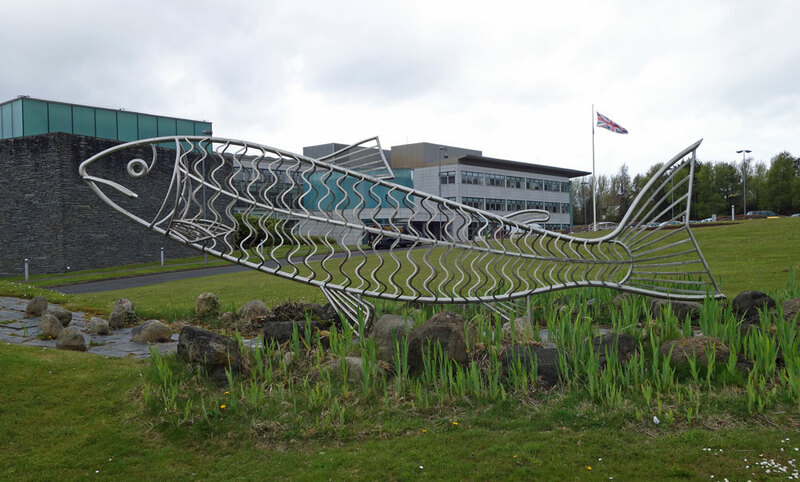 Instead, I took a picture of a family grave site at Killowen Church, as well as a photo of the iconic Coleraine salmon - just to remind myself that even though I may drop a line in the water, and not hook anything, the fish is still out there waiting for me. Btw the Mayor Alderman and Burgesses of the Town of Coleraine in the Province of Ulster and Richard JACKSON of the City of Dublin Esq. of the other part… demised unto said Richard JACKSON all those the customs of the Markets and Faires of the said town of Coleraine and County of Londonderry. WITNESSES: John OLPHERTS. Thomas ADERTON. Samuel KINKEAD all of the said town of Coleraine. NOTE: This Richard JACKSON (1673-1730) was a son of Capt. William JACKSON and Susan BERESFORD. He was also the father of Richard JACKSON (abt 1722-1787) of Forkhill, Co. Armagh. SEE: Timeline of Jacksons of Coleraine. James JACKSON of City of Dublin, Gent & James BANKHEAD of Coleraine, Co. Londonderry Merchant of the other part. James JACKSON let to James BANKHEAD 11/6 part of freehold called Clanlary [Thanks to Linda Gilmore, I now know that Clanlary =Glenleary], Parish of Camassmacasque, [Camus Macosquin Glebe is a townland in the Parish of Macosquin] Co. Londonderry. WITNESS: Benjamin JOHNSON, Clerk & Edward DALTON, Notary. NOTE: Because of other JACKSON holdings in the parish of Macosquin (ie 45822), I suspect he is related to Richard JACKSON (abt 1722-1787). There was also a James JACKSON included in the lists of soldiers (or their representatives) who settled in 1665 in Parish of Billy, Baroney Carey, Co. Antrim. Also in Co, Antrim in this category were John JACKSON and James JACKSON who settled in the Parish of Dunnaghy, Barony Kilconway. They need to be kept in mind. SOURCE: The MacDonnells of Antrim p 466. Rev. Jasper BRETT, Chancellor of Connor unto Richard JACKSON, Esq. of Dublin City of town & lands of Ballynewport alias Newportstown [Parish Rathmullen, Barony Lecale Upper] in Lecale (bar.) Co. Down [term and rents not mentioned]. Michael WARD Esq. of Dublin City mentioned; REGISTRARS: Charles CHURCH; James BATEMAN, mayor and JP, Coleraine; George HAMILTON, JP of Co. Limerick. WITNESSES: Rev William BOYD, Vicar of Ramoan, Antrim; Magnus PRINCE, Doctor of Phisik, Lisburne, Antrim; John ALLEN, servant to Michael WARD; Edward BRUMHALL[?].. Thanks to Michael Stewart SEE: Jacksons of Coleraine Tree. NOTE: This is the Richard JACKSON (1673-1730), husband of Elizabeth BOYD, and son of William JACKSON and Susan BERESFORD. He had several business interests in Dublin as a result of his inheritance from his Uncle Samuel JACKSON. This Rev. William BOYD was the father of Elizabeth BOYD, wife of Richard JACKSON (1673-1730). The Rev. was probably also a direct ancestor of Rev. Daniel Gunn BROWN through Rev. Daniel’s mother, Beatrice BOYD. See also Parish Ballynewport, Barony Rathmullen, Co. Down in deed # 27953. Indenture of Lease. Randall Rt Hon Earl of Antrim demised to Archibald McDONNELL, Gent of Ballynebantry 4 Quarters of land in Attelicur?, Barony of Killconway, County Antrim, for 31 years. WITNESSES: William JACKSON Esq. of Coleraine, Co. Londonderry; Alexander McNAUGHTEN, Esq of Benverden, Co. Antrim; Edmond KEATING, Gent of Berdeville, Co. Antrim & Charles SMITH. NOTE: William JACKSON (1695-1744), husband of Frances EYRE, and son of Capt. William JACKSON and Elizabeth GORGES. I suspect that Attelicur is the townland of Anticur (903a), Parish Rasharkin, Co. Antrim. Btw Walter BUNBURY City of Dublin Esq. & Dame Elizabeth IRWIN his wife of 1 pt. James KENNEDY of City of Dublin Esq. of other part…. Legal case & lands in Blind Quay…. Lengthy. NOTE: The BUNBURY-JACKSON connection is through Rose JACKSON (1668-1738), daughter of William JACKSON and Sarah BERESFORD. Rose JACKSON married Thomas BUNBURY. To son Thomas BOLTON lands in Co Meath… son Joseph BOLTON… son Richard… to son Joseph BOTON 26 acres Creekstown Co Meath (lands purchased from Patrick BARNWELL) also Henry NICKS lands in Creekstown … Elizabeth BOLTON daughter of Joseph BOLTON. NOTE: Thomas JACKSON (1680-1651) son of William JACKSON and Susan BERESFORD, both of Coleraine, held leases to lands here. SEE: Jacksons of Coleraine Tree. Drumaheglis, Parish Ballymoney, Barony Upper Dunluce. Rosnashane, Parish Finvoy, Barony Kilconway. A memorial of indented Deeds of Lease and Release bearing date Respectively the thirtieth and thirty first day of December: one thousand seven hundred and twenty six made and perfected between John BALL of Loghross, Co. Armagh, Esq. of 1st part & Thomas JACKSON of City of Dublin Esq. Of the other part. By which said deed and release the said John BALL for the consideration therein mentioned Did give grant bargain sell, Release & Confirm to Thomas JACKSON in his actual possession by virtue of the said lease all that tate of the old Castle of Creckstown & 106A 1R 34P of the land thereunto adjoining in the Barony of Ratbath, Co. Meath inders Rents Issues and Profitts of the same. To have and to hold the said premises with the appurtenances the said Thomas Jackson and his heirs yielding and paying therefore and thereout unto the said John BALL his heirs and issue for ever the yearly rent of five shillings sterling per acre for every of the said acres and after that rate for the said one Rod and thirty four perches in half yearly payment viz on every first day of May and November the first payment to be made on the First Day of May next ensuing the Date of the said Deed of Release. Which said Deeds of Lease and Release were duly perfected on the said thirtieth and thirty first Days of December one thousand seven hundred and twenty six. . WITNESS: William CHURCH of Coleraine, Co. Londonderry, Gent; John DOWNING of City of Dublin, Gent; Henry ARKWRIGHT, City of Dublin. NOTE: Lieut. Thomas Ball, of Fleetwood's Regt., the father of John BALL, received grants of land in several counties of Ireland, which were confirmed under the Act of Settlement. In Crickstown, barony of Ratoath, he received "a mansion house, orchard, garden, and groves,''. They were same BALL family with leases at Urker and elsewhere in Creggan Parish. Thomas JACKSON (1680-1751) was a son of William JACKSON and Susan BERESFORD, both of Coleraine. I suspect that this John DOWNING was John DOWNING (1700-1785), son of Adam DOWNING and Ann JACKSON, daughter of John JACKSON (1630-aft 1688) This John JACKSON was an uncle of Thomas JACKSON (1680-1751). Henry ARKRIGHT is mentioned in a number of JACKSON deeds, and is likely a lawyer. In a book, Between the Tides: Shipwrecks of the Irish Coast, he is referred to as a Collector in 1703. He was a Collector of Revenue for Galway in 1709. Btw Mayor Alderman and Burgesses of Corporation of Colerain, Co Londonderry of 1 pt & William JACKSON Esq. & Griffin HOWARD Gent two of the aldermen of the said Corp. inconsid of 100 pounds paid by JACKSON & HOWARD let to them the office of the Clerke of the Market of Coleraine and also all that and those the Customs of the faires and Markets… rent of 36 punds sterling. Executed by Arthur CHURCH, mayor of Coleraine Gent, & Frederick CURTIS Chamberlaine. WITNESSES John GALT, William & John CURTIS, all of Coleraine. NOTE: I believe that this is the William JACKSON (1695-1744), husband of Frances EYRE (1708-?) of Galway. NAMES: John BALL of Three Castles aka Bannough, Kilkenny; Thomas JACKSON of Dublin; Dorothy BALL née JACKSON; John HAMILTON; John DOWNING; William PARRY. http://www.thesilverbowl.com/documents/1730Feb23-BALL-JACKSON.html NOTE: Dorothy JACKSON was a daughter of William JACKSON (abt 1666-1712) and Elizabeth GORGES (abt 1675-1747). Thomas JACKSON (1680-1781) was her uncle. Btw Lieut William GODFREY of the Hon Col HOWARD’s Regiment of foot of the one part & Richard JACKSON of the City of Dublin Esq. of the other pt. 150 pounds paid to GODFREY for lease of Drommore als Drumore situate in territory Ballibette or Portion of land called Moytullagh, Co. Londonderry. WITNESS: Alexander McCAULEY of City of Dublin Esq. & James SAUNDERS clerk to Richard PREST of same city. NOTE: Although there are 4 townlands called Dromore in Co. Londonderry: Parish of Desertmartin, Barony of Loughinsholin; Parish of Kildolagh, Barony of NE Liberties of Coleraine; Parish of Macosquin, Barony of Coleraine; Parish of Tamlaght Finlagan, Barony Keenaght – my best guess is that this Drommore is in the Parish of Macosquin, Barony of Coleraine because in documents at PRONI, the land called Moytullagh was mentioned in the Barony of Coleraine. SEE: PRONI LPC/1428 & LPC/1429. NOTE: This is the Richard JACKSON (1673-1730), husband of Elizabeth BOYD, and son of William JACKSON and Susan BERESFORD. He had several business interests in Dublin as a result of his inheritance from his Uncle Samuel JACKSON. ASH-AVERILL Bk 423 1708-1738 Londonderry & Coleraine Pennyburns Mills. For 623 pounds 9s 9d William ASH made over to Isobel AVERILL mills called Pennyburn Mills near City of Londonderry. NOTE: I am curious about the JACKSON-ASH connections and a possible link to Coleraine. One possible connection to Coleraine is because of a marriage btw a Sarah ASH and a William JACKSON. SOURCE: Mackenzie's Memorials of the Siege of Derry: Including His Narrative and Its Vindication. John Mackenzie. Captain Thomas ASH was ancestor of William H ASH, of Ashbrook, Esq. 2 tenements on Pump Street in City of Londonderry marked 211 & 212 transferred from William ASH to William JACKSON of Colerain Esq. I consid of 50 pounds. NOTE: I believe that this is the William JACKSON (1695-1744), husband of Frances EYRE (1708-?) of Galway. I am curious about the JACKSON-ASH connections and a possible link to Coleraine. A 1738 Map shows a William ASH on Pump Street (alias Church Street) in Londonderry. One possible connection to the Coleraine JACKSONs is because of a marriage btw a Sarah ASH and a William JACKSON. SOURCE: Mackenzie's Memorials of the Siege of Derry: Including His Narrative and Its Vindication. John Mackenzie. Captain Thomas ASH was ancestor of William H ASH, of Ashbrook, Esq. Stephen GODFREY to James DONALDSON of Parish of Coleraine part of Dundooen formerly held by Alderman William GODFREY. NOTE: Dundooan is a townland that is in 3 parishes: Ballyaghran, Ballywillan and Coleraine, all in the Barony NE Liberties of Coleraine. Lease btw William JACKSON, of Coleraine, Co. Londonderry, Esq to Thomas HOLLYDAY [aka Thomas HALLIDAY] of Waterside in the parish of Killowen, Co. Londonderry, Innkeeper .. house or tenement which HOLLYDAY possessed in the south side of Bridge St.,, Co. Londonderry… meared and bounded by Edward ADERTON’s field on north & south and in west with road leading to Articlave.. WITNESS: William KENTON of Coleraine, schoolmaster & Samuel BRINDLEY clke to Isaac TODD. NOTE: I believe that this is the William JACKSON (1695-1744), husband of Frances EYRE (1708-?) of Galway. Waterside is a townland in the Parish of Killowen, NOTE: Bridge Street is not included in the 1738 Map, but is included on contemporary maps. The road to Articlave heads north-east out of the City. William JACKSON of town of Coleraine, Co. Londonderry demised to David LINDSAY of the same, merchant, Co. Londonderry… land in Parish of Drumboe, Manor of Clothworkers, Co. Londonderry for term of 35 years at rents of 11 pounds 15s 2d. WITNESS: Thomas HOLLYDAY [aka Thomas HALLIDAY], linen draper & William CHURCH both of Coleraine. NOTE: I believe that this is the William JACKSON (1695-1744), husband of Frances EYRE (1708-?) of Galway. Lease btw William JACKSON of Coleraine, Co. Londonderry of 1st pt; Frances his wife of the 2nd pt; & the Hon Mrs. MOORE of the City of Dublin , widow of 3rd pt. JACKSON had received payment of £1300 from MOORE for lands of Ballimadigan, Drumnequile, Donbally-Carn Ringrashbeg Ringrashmore Artaclave etc … in Co. Londonderry. WITNESS: William CHURCH & William KINKEAD. NOTE: This is William JACKSON (1695-1744) & his wife Frances EYRE. What is interesting is the range of parishes that these townlands are in, however, the three parishes do border one another. The townlands are the same as in deed #59683. Donbally-Carn I don’t know where this is. Artaclave, Parish Dumboe, Barony Coleraine. William JACKSON of Coleraine in consid of 5s paid to him by Henry CARY of Dungivin, Co. Coleraine Esq. Arthur CHURCH of Coleraine Esq. & Thomas JACKSON of City of Dublin Esq sold to Messrs Henry CARY, Arthur CHURCH & Thomas JACKSON town and lands of Ballimadigan, Drumnequile, Donbally=Carn Ringrashbeg Ringrashmore Artaclave etc. WITNESS Farmer GLOVER & William CHURCH of Coleraine. NOTE: I believe that this is William JACKSON (1695-1744) and his uncle Thomas JACKSON (1680-1751). The townlands are the same as in deed #58582. Dungivin, Paarish Dungiven, Barony Keenaght. Whereby William JACKSON of Coleraine, Co. Londonderry Esq. having contracted many & great debts & minded to vest his estate in Trustees in payment thereof and in consideration of the sum of 5 pounds sterling sold to Messrs Henry CARY, Arthur CHURCH & Thomas JACKSON town and lands of Ballimadigan, Drumnequile, Donbally=Carn Ringrashbeg Ringrashmore Andaclave etc…. all that Manor commonly called the Manor of Clothworkers, Barony of Coleraine, Co. Londonderry. NOTE: I believe that this is William JACKSON (1695-1744) and his uncle Thomas JACKSON (1680-1751). The townlands are the same as in deed #58582. Btw Clark JACKSON of Drumballyhagen Co. Londonderry Gent of 1 pt & John MARRON of Maghera Merchant of other pt. … for natural lives of Adam JACKSON eldest son of Clark JACKSON aged abt 13 years Samuel PATERSON eldest son of William PATERSON Tobermore [Parish Kilcronaghan, Barony Loughinsholin] in proportion aged about 11 years & John O’CAHAN 2nd son of James O’CAHAN of Drumballyhagen… in presence of Thomas ASH and Rowly HILL Justices of the Peace for Londonderry. NOTE: The CLARK and JACKSON families of Maghera were closely affiliated, and likely related. They still remain a mystery to me. Assuming that the name Adam did not come out of thin air, it may be pertinent that in Deed # 6033 , there is an Adam JACKSON, a weaver of Pimlicoe in the Liberty of Thomas Court and Donore Co. Dublin in 1714 (a time and place where there was a concentration of JACKSONs in the linen trade). I am also curious about the JACKSON-ASH connections and a possible link to Coleraine. A 1738 Map shows a William ASH on Pump Street (alias Church Street) in Londonderry. One possible connection to the Coleraine JACKSONs is because of a marriage btw a Sarah ASH and a William JACKSON. SOURCE: Mackenzie's Memorials of the Siege of Derry: Including His Narrative and Its Vindication. John Mackenzie. Captain Thomas ASH was ancestor of William H ASH, of Ashbrook, Esq. Btw William JACKSON Fortwilliam Parish of Killcranachan, Co Londonderry Gent of 1 pt & Walter LINDSAY of Cahow Esq. & Barbara CORNWALL of Cornwalls Grove, spinster both in Barony of Dungannon Co. Tyrone Esq. The last will and testament of John CORNWALL late of Cornwall’s Grove of other pt. Marriage intended to be had btw William JACKSON jr son of sd William JACKSON & Miss Martha CORNWALL, daughter of John and Barbara CORNWALL… lands of Ballynasarren…NOTE: I do not know what townland Fortwilliam might be in, although I suspect Tobermore, nor do I know where Ballynasarren might be. Lease by Catherine ROWLEY of City of Dublin spinster & Rowley HILL of Walworth, Co. Londonderry esq. to William JACKSON Jr of Dunnigrenan Parish of Kileronaghan, Co Londonderry Surgeon bearing date the 17th day of June 1735 whereby Catherine ROWLEY demised to said William JACKSON all that part of the half town of Dunnigrennan formerly held by David BIGOTT John McMICHAEL together with the old Highway from the househead wherein Gillaspy M’CONNAGHY formerly lived to the Flush called Dunigrinen Flush also that part of the town of Tobermore cont 3 tenements ranging to the street of Tobermore Town on the South and to a road or way of forty foot broad of the rere made out of Tobermore town to Dungrinene Fort on the West which was served out of this demise… more description.. were demised by Hugh ROWLEY to Robert Mc[???] and the same was held by Capt William JACKSON father to the said William JACKSON excepting unto the said Catherine ROWLEY & Rowley Hill the meadow next to the flush which Hugh ROWLEY kept to his own use. All to William JACKSON jr for lives of said Wm JACKSON jr. Ann CUNNINGHAM jr daughter of Gorges CUNNINGHAM of Spring Hill, Co. Londonderry & Martha CORNWALL daughter of John CORNWALL of Mullaghmargaret Co. Tyrone Gent. WITNESS: Letitia HILL, spinster, John CORNWALL sadler George MOORE Public Notary all of City of Dublin. NOTE: See reference to marriage of a William JACKSON to a Martha CORNWALL ROD #70504. This is a link – I believe – from the JACKSONs of Tobermore & the Jacksons of Coleraine. William JACKSON of Colerain, Co Londonderry Esq. .. town land called Bogtown lands in Drumboe, Manor of Clothworkers to David MILLER & John MILLER… rent of 15 pounds 13s 8d together with one Bowl or twelve bushels of fluffed and cleaned oats… and deliver to the Mansion House one hundred barrels of turf every barrel containing ten bushels of their own cutting and winding…35year term.. Witnessed: Samuel MOORE & John BOYD. Of Ballywillrick, Co Londonderry. NOTE: John BOYD may be related to JACKSONs through the marriage of Elizabeth BOYD to Richard JACKSON (1673-1730). William JACKSON of Coleraine, Co Londonderry to John LONG for 1/3rd part of Ballyhacket Moygilligan in parish of Drumbo, Manor of Clothworkers for similar terms as above. William JACKSON of Colerain, Co Londonderry part of Ballyhacket Clonconney, Parish of Drumbo, Manor of Clothworkers, to Benjamin BOYD. Similar to the lease above NOTE: There are four townlands, some would be a fit: Ballyhacket Glenahorry; Ballyhacket Magilligan; Ballyhacket Lisawilling; and Ballyhacket Toberclaw. I do know which one it might be. ??? Is Benjamin BOYD related to JACKSONs through the marriage of Elizabeth BOYD to Richard JACKSON (1673-1730)? Similar to the lease above. Lease of townland of Ballymoney, Parish of Dunboe, Manor of Clothworkers did set to farm to James WILSON, James RANKIN & Wm LOUGHRICK all of Ballymoney also that townland of Ballymoney now in their possession… term of 35 years.. yearly rent of 5 pounds 5 s 6p with duties to wit 30 scaks of turf of their own cutting and winding and every sack containing ten bushels or else 7s 6d in Lieu to be delivered yearly at the Mansion House near Colerain. WITNESS: William CHURCH & Samuel MOOR both od Colerain Memorial witnesses Samuel MOOR & John BOYD. NOTE: John BOYD may be related to JACKSONs through the marriage of Elizabeth BOYD to Richard JACKSON (1673-1730). Deed of Michael WARD Esq. One of the Justices of his Majesties Court & Hugh BOYD of Ballycastle late Drumwillen, Co Antrim Esq. & John ANDERSON City of Dublin Apothecary executors of the last will and testament of Richard JACKSON late of the City of Dublin dec’d of the first part. Hamilton GORGES of the City of Dublin Esq. Of the 2nd pt. & William JACKSON of Colerain, Co Londonderry of 3rd pt ... reciting earlier deed... various lands... NOTE: Hugh BOYD (1690-1765) was a brother of Elizabeth BOYD who married the Richard JACKSON (1673-1730) of this memorial. Hamilton GORGES (1712-1786) was a nephew of the Elizabeth GORGES (abt 1675-1747) who married William JACKSON (abt 1666-1712). William JACKSON was a brother of the deceased Richard who had lived in Dublin. Drumboe – probably my transcription error. Should be: Artdillan, Parish Dunboe, Barony Coleraine. William JACKSON of Colerain, Co Londonderry.. [other names] … reciting earlier deed Oct 13, 1729, the Clothworkers of London had demised to Richard JACKSON of Dublin Esq all that Manor of Clothworkers in the Kingdom of Ireland for a term of 51 years dating from May 1, 1720… reciting that the said Richard JACKSON had by his deed bearing dated Oct 13, 1729 declared that the said indenture so made by the Master Wardens & Commonwealth aforesaid was made in trust for the said William JACKSON by way of a better security for the sum of 2,050 pounds 4 shillings and sixpence which the said William JACKSON then owed unto him… William CARY & William JACKSON discharged the debts and assigned [list of townlands] to Hercules HEYLAN.. WITNESS Connolly MCAUSLAND of Fruithill Esq. & John M’ALESTER of Colerain Gent & Dominick HEYLAND of the same Esq. NOTE: Perhaps should order. Honorable Marcus Earl of Tyrone granted [long list of townlands] in Clothworkers Manor to Richard JACKSON of Coleraine. Deed btw Hon Michael WARD Esq one of the trustees of his Majesties Court of Common Pleas in Ireland and Hugh BOYDE of Ballycastle Co Antrim Esq. Surviving executors of Richard JACKSON late of the City of Dublin Esq. deceased. Of the 1st pt; Richard JACKSON of the City of Dublin Esq only surviving son of the said Richard JACKSON deceased of the 2nd pt; Richard JACKSON of Coleraine Esq only son and heir and devisee of William JACKSON Esq. late of Coleraine [prob 1695-1744] deceased of the 3rd pt. Following is 2 pages of townlands in Barony of Coleraine transferred to Richard JACKSON son of William JACKSON with consent and thanks to consideration from Richard JACKSON son of Richard JACKSON. NOTE There are two surviving Richard JACKSONs and one living Richard JACKSON in this deed – to confound us. The two surviving Richard JACKSONs were 1st cousins, once removed. 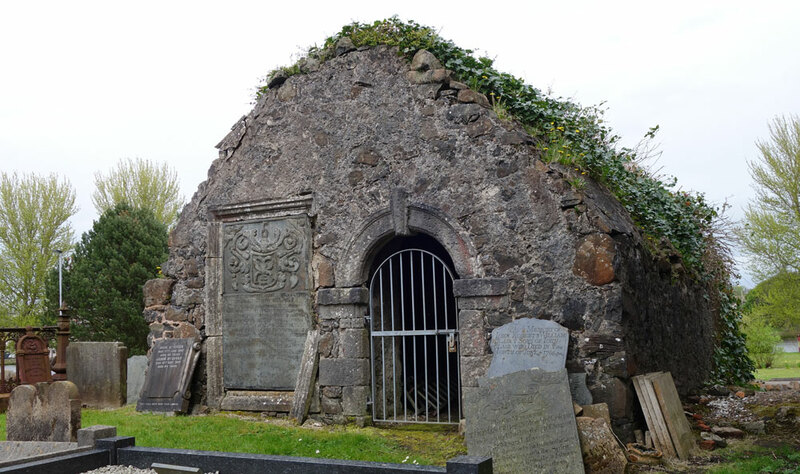 Richard JACKSON (1722-1787) of Forkhill only surviving son of Richard JACKSON (1673-1730) of Dublin, Esq deceased (husband of Elizabeth BOYD), The half-brothers of Richard JACKSON of Forkhill, William JACKSON and Thomas JACKSON died as infants. His full brothers Hugh JACKSON d.s.p. and Beresford JACKSON d.s.p. must have also predeceased him. Richard JACKSON (aft 1729-1789), husband of Anne O’NEIL, only son & heir of William JACKSON late of Coleraine deceased. The other two sons of William JACKSON & Frances EYRE died before 1744 and were minors d.s.p. Hugh BOYD (1690-1765) was a brother of Elizabeth BOYD who married the deceased Richard JACKSON (1673-1730). Philip FLETCHER of Lisburn Esq of 1 pt & Richard JACKSON of Coleraine Esq of other pt for 500 pounds pd by Richard JACKSON … granted to JACKSON tenement commonly called Manor or Mansion House and all the lands in Manor of Clothworkers, Parish of Dunboe, Londonderry & also to gardens commonly called the Higher and Lower Dardrees the higher being accounted for two balyboes of land and the Lower for two ballyboes of land… Barony of Colerain, Co Londonderry.…. NOTE: The Mansion House is also known as Jackson Hall. I suspect that these two JACKSONs are the ones who were 1st cousins once removed. The Richard JACKSON (aft 1729-1789) of Coleraine Esq,, who received the payment was the son of William JACKSON & Frances EYRE, and the Richard JACKSON who paid him was the Richard JACKSON of Forkhill. I do not know where the Higher and Lower Dardrees are. 2. Richard JACKSON (aft 1729-1789), husband of Anne O’NEIL, only son & heir of William JACKSON late of Coleraine deceased. Marcus McCAUSLAND of Daisiehill, Co Londonderry… credits of Hercules HEYLANS of Castleroe, Co Londonderry Esq. of one pt & Richard JACKSON of Coleraine of other pt…. long deed mentions Henry CARY and many townlands in Londonderry. NOTE: Richard JACKSON (aft 1729-1789) of Coleraine, son of William JACKSON & Frances EYRE. Daisy Hill is in Newtownlimavady, Parish Drumachose, Barony Keenaght; Castleroe is in the Parish Macosquin, Barony Coleraine. Lease btw Richard JACKSON of Coleraine Esq of 1st pt; John McALISTER of Coleraine Gent of 2nd pt; & Henry HART of City of Dublin Esq of 3rd pt. land released to Henry HART – in his actual possession - Ballymadegan Drumnagil Donballyrne Ringgrafsbeg Ringgrafsmore Artaclave and the Upper and Lower Altabreen all in Co Londonderry WITNESS: John BOWDEN of City of Dublin Esq & William KEELER servant to sd Richard JACKSON. NOTE: Richard JACKSON (aft 1729-1789) of Coleraine, son of William JACKSON & Frances EYRE. Ballymadegan aka Ballimadigan, Parish Dunboe, Barony Coleraine. Ringgrafsbeg aka Ringrash Beg, Parish Macosquin, Barony Coleraine. Ringgrafsmore aka Ringrash More, Parish Macosquin, Barony Coleraine. Artaclave aka Articlave, Parish Dunboe, Barony Coleraine. Upper and Lower Altabreen aka Altibrian, Parish Dunboe, Barnony Coleraine. John BALL of Three Castles Co. Kilkenny Esq. Dorothy BALL otherwise JACKSON his wife [abt.1696-1760]; Jane JACKSON of the town of Drogheda widow & sole executor of Thomas JACKSON late of Crickstown in the Co. of Meath Esq deceased Luke VIPOND and Gorges Edmond HOWARD of the City of Dublin Esq. & Thomas SMITH of the City of Dublin Gent of the one pt & Joseph BAYLY of the City of Dublin Gent & Rev Abraham SANDIP of Killmoon Co Meath of the other part and the release made between John BALL Dorothy of the first part Jane JACKSON of the 2nd part the Rev Ralph COCKYN [variant spellings may be useful: COCKAINE] of Raheny in the Co Dublin & Ann COCKYN otherwise LEVESY otherwise JACKSON his wife of the 3rd part & Rev Bigoe HENZEL of Creekstown Co Meath of the 4th pt said Luke VIPOND and Gorges Edmond HOWARD of the 5th pt and Thomas SMITH of the 6th pt and said Joseph BAYLY and Abraham SANDIP of the 7th pt… land sold for one year. NOTE: Dorothy JACKSON (1696-1780) was wife of John BALL. Jane JACKSON may have been a 2nd wife of Thomas JACKSON (1680-1751) of Coleraine and Creekstown (The current tree has Margaret BERESFORD as a wife). Ann COCKYN als JACKSON was likely the mother of Thomas JACKSON COCKIN, son of Rev. Ralph COCKYN. SEE: ROD: 308-633-208372, 1776 Jun 3. She was a daughter of Thomas JACKSON (1680-1751) [ ROD 217-547-146565]. The JACKSON-COCKYN connection intrigues me because of the mystery of the ancestry of the Rev. William JACKSON (1737-1795) born in Newtownards, Co Down, who was a United Irishman betrayed by a John COCKAYNE. There may or may not be a familial connection. Atchave aka Articlave, Parish Dunboe, Barony Coleraine. Richard JACKSON Esq. of the one pt & Alexander MAKACHAN of Colerain Co Londonderry of the other.... transfer of part of townland of Donballykarn 47 acres situate in Manor of Clothmakers.... NOTE: I have not been able to find Donballykarn. Richard JACKSON Esq. is probably Richard JACKSON (aft 1729-1789) of Coleraine, son of William JACKSON & Frances EYRE. Marriage btw John DOWNING of Rowes Giftin Co Londonderry Esq & Ann DOWNING his wife of 1st part. Charles DAWSON of Castle Dawson Co Londonderry & Sarah DOWNING of the sd John & Ann DOWNING of the 2nd pt. Richard JACKSON of Coleraine Esq of 3rd pt;… marriage btw Charles DAWSON & Sarah DOWNING… made over to John DAWSON & Richard JACKSON town and lands of Warrenstown & other townlands in Co Meath… 500 pounds marriage portion. NOTE: Anne DOWNING’s grandmother was Anne JACKSON (d btw 1718-1726), daughter of John JACKSON (1613-aft 1688) of Coleraine, and wife of Col Adam DOWNING (1666-1719). Sarah DOWNING was the daughter of Capt John DOWNING & Anne ROWE, and married Charles DAWSON. I suspect that the Richard JACKSON was Richard JACKSON (aft 1729-1789) of Coleraine, son of William JACKSON & Frances EYRE. Castledawson is in the Parish Magherafelt, Barony Loughinsholin. Revd Edward GOLDING Archdeacon of Diocese of Derry of 1st part Mary JACKSON otherwise GOLDING his wife of 2nd part & Rev John GAGE of Aughadowey Co of Londonderry ... whereas marriage had taken place between Edward GOLDING & Mary JACKSON & Mary his wife had come to an agreement with Richard JACKSON of Colerain in said Co Esq brother to said Mary ... bond of 4,000 pounds for which Mary gave Richard a release of demands on the will of her father William JACKSON dec’d. NOTE: Mary JACKSON & Richard JACKSON (aft 1729-1789) were both children of William JACKSON & Frances EYRE. Aghadowey, Parish Aghadowey, Barony Coleraine. Peter METGE to John DOWNING [1700-1785] of Rowesgift Co. Derry and Anne DOWNING oth ROWE [1711-1776]; Richard JACKSON of Coleraine involved. I suspect that the Richard JACKSON was Richard JACKSON (aft 1729-1789) of Coleraine, son of William JACKSON & Frances EYRE. Will of John BALL, Frederick St., Dublin, Esquire. My wife Margaret BALL, Thomas BALL, Seapark, County Wicklow, Esq., Richard JACKSON, Coleraine, Esq., and Richard JACKSON, Forkhill, County Armagh, Esq., trustees and executors. My dear stepdaughter Martha Ransford. My stepson Robert Ransford. My sister Araminta Caulfield. A ring and plate to my daughter Dorothea Margaret Shinton and her children quite out of power of her husband Richard Shinton. My cousin Samuel BALL, now in Germany. My old servant Brian Murphy. My old friend Mrs. Elizabeth ADAMS alias KYLE. My friend Mar. PATERSON, Sgt. at law, Esq. My friend Dr. Charles LUCAS. 1. Richard JACKSON (aft 1729-1789), husband of Anne O’NEIL, only son & heir of William JACKSON late of Coleraine deceased. 2. Richard JACKSON (1722-1787) of Forkhill only surviving son of Richard JACKSON (1673-1730) of Dublin, Esq deceased (husband of Elizabeth BOYD),. They are in my Rootsweb tree. Btw John McALLISTER of Coleraine of the sts pt & Richard JACKSON, James LESLIE & Stratford CANNING Esq & Hugh LYLER Merchant of the other pt.. Lands included 6th t of lands of Glenlary otherwise Clonlary Co Londonderry; town and lands near Colerain commonly called The Lodge lately held by Thomas M’LOCKLIN deceased; and another in Blind Gate Lane in Coleraine now possessed by Robert SIMPSON Innkeeper; ; farm called Carthill near Coleraine now in possession of Christopher CUNNINGHAM; three houses in the commons of Coleraine; the bakery in the New Row in Coleraine; a moiety of the Bleach Yard & farm at Ballydivit in Londonderry; part of the townland of Termoyle; a stock farm in the townland of Sionce… NOTE: The M’LOCHLIN name is interesting, given the fact that a Margaret O’LAUGLIN (abt 1722-1797) married George JACKSON (1718-1782) of Urker and Liscalgot, Co. Armagh, and a significant number of circumstantial facts leads me to believe that his line comes from Coleraine. I cannot be sure which Richard JACKSON this might be. He might be the Richard JACKSON butcher, or he could be one of the wealthy JACKSONs who trace back to Kirkby Lonsdale, Westmorland. Ballydivit aka Ballydevitt, Parish Aghadowey, Barony Coleraine. Mentions that Richard JACKSON of Coleraine was executor of will of John MacKAY, Coleraine, d.1765, Thanks to Linde Lunney. Richard JACKSON of Colerain, Co Londonderry, Esq. Of 1st pt Charles DAWSON of Limerick in Co Limerick of 2nd pt & Peter METGE of Athlunmney, Co Meath Esq.... lands of Warrenstown, Co Meath... NOTE: Charles DAWSON was husband of Sarah DOWNING, and a great-grand-daughter of Anne JACKSON (d btw 1718-1726), daughter of John JACKSON (1630-aft1688) of Kirkby Lonsdale, Westmorland as well as of Coleraine. Given these connections, I suspect that this Richard JACKSON was Richard JACKSON (aft 1729-1789) of Coleraine, son of William JACKSON & Frances EYRE. Btw Richard JACKSON of Coleraine, Co Londonderry & John ALLEN of town & Co aforesaid, Innkeeper of the other pt. … part of townland of Ballykern then in ALLENs possession 23 acres 3 rood plantation measure…. Lives Isaac, son of Isaac TODD…. NOTE: I suspect that this Richard JACKSON was Richard JACKSON (aft 1729-1789) of Coleraine, son of William JACKSON & Frances EYRE. The possible TODD-JACKSON connection is worth exploring. An Andrew TODD (1748-1805) married a daughter of James BIRCH (?-1727) and Mary JACKSON. So far, we do not know where she came from. Ballykern If this townland is in Co. Londonderry, then it is likely the townland of Ballykeen, Parish of Tamlaght Finlagan, Barony Keenaght. Richard JACKSON of Coleraine of 1 pt & Giles CROMP of City of London of other pt. 4. Richard JACKSON (aft 1729-1789), husband of Anne O’NEIL, only son & heir of William JACKSON late of Coleraine deceased. Lease 27 Jan 1775 whereby Richard JACKSON of Coleraine Esq demised to Margaret CALDWELL and Robert RICE of said town all that and those the three fields at Spittlehill within a quarter of a mile of Coleraine as the same was then possessed by Margaret CALDWELL (Royalties excepted) to hold to 31 years at the rent of 24 pounds sterling WITNESS: John LITTLE of Coleraine Gent & Patrick SMYTH of City of Dublin Gent. NOTE: I suspect that this Richard JACKSON was Richard JACKSON (aft 1729-1789) of Coleraine, son of William JACKSON & Frances EYRE. He was also the husband of Anne O’NEIL. Spittle Hill, Parish of Coleraine, Barony NE Liberties of Coleraine. It is on the eastern border of the urban part of Coleraine. Btw Jackson WRAY late of Coleraine but then of Ballycastle, Co Antrim Esq. & Rev James SMYTHE Vicar of Ardmay, Co. Antrim of the 1 pt. Thomas THOMPSON of Greenmount, Co Antrim Esq and the lease made btw Jackson WRAY, Richard JACKSON of Forkhill Co Armagh Esq & the surviving Executors of the will of Hugh BOYDE the younger of Ballycastle Esq son & heir of Alexander BOYDE late of Ballycastle Esq, deceased. Who at the time of his death was son and heir of Hugh BOYD… more BOYD (hard to read). NOTE: This Jackson WRAY (1715-1793) was a son of Henry WRAY and Jane JACKSON. He married Leonora BOYD, daughter of Hugh BOYD (which Hugh BOYD, I do not yet know). Alexander BOYD was a brother (or half-brother) of Elizabeth BOYD, wife of Richard JACKSON (1673-1730). This Richard JACKSON was the father of the Richard JACKSON (1722-1787) of Forkhill. This Ballycastle was probably the townland in the Parish Ramoan, Barony Cary, Co. Antrim. NAMES: Richard JACKSON of Coleraine; George HART aka HARTE of Dublin; David LaTOUCHE jr. of Dublin; Henry HART aka HARTE; William JACKSON; Frances EYRE of Eyrecourt, Co. Galway; Elizabeth MOORE; John McALLISTER; William GREER; Thomas HAND; John LITTLE; Thomas STEPHENSON; William KELLY. OTHER PLACES: Ballymadegan; Drumnaquilt [Parish of Killowen, Barony of Coleraine]; Donballycarne; Ringrassbegg Ringrassmore [Parish of Macosquin, Barony Coleraine]; Ardaclaire Upper and lower Altabrean, County Londonderry. Donballycarne aka Donbally-Carn I don’t know where this is. Ardaclaire aka Artaclave, Parish Dunboe, Barony Coleraine. Upper and lower Altabrean, aka Altibrian, Parish Dunboe, Barony Coleraine. Hatton TILLE of Coleraine of 1 pt & Rev Galbraith YOUNG of Coleraine; James STEWART of Grace Hill Antrim & Richard JACKSON & Elizabeth his wife of the other part. NOTE: See also: Deed #306027. This Richard JACKSON was a butcher. Miles NORTH- Edward NORTH. Ballinclea, This is a four page memorial. Indentured deed between Miles JACKSON late of Jackson’s Hall in the County of Westmorland and now of the City of Dublin Esq. and Edward NORTH of Bloomfield in Co Dublin Esq. of the other part…. Miles NORTH had levied a fine sur conveyance de droit com ceo [NOTE: Sur Cognizance De Droit Come Ceo. ... acknowledgment of a former conveyance originally made]; made and provided unto the said Edward NORTH of all and singular the town and lands of Knightston otherwise Kingstown otherwise Knitstown, Coleman’s Town and Ballycle otherwise Ballanclea otherwise Ballinclea and the Commons belong to Ballincea situate lying and being in the County of Dublin…[also] lands of Castletownmore otherwise Castletownmoore, Ardlonan, Drishoge otherwise Dryshook, [Marvellstown] Drakeath, Raisk otherwise Reiske otherwise Reuske, Emlough otherwise Emlogh and Oristown situate lying and being in the County of Meath [with all land and appurtenances] …. [also] lands of Lisgrea otherwise Lisgreath otherwise Lisgoath Drumagolan otherwise Drumaghagolan otherwise Drumgola, Brooklany otherwise Brackloney otherwise Bracklonagh otherwise Brally, Drumsamoney, Ashon otherwise Ashain or Asham otherwise Assondrass & Liskerry sitate lying and being in Co. Cavan with all the appurtenances … [also … Town and lands of Lattin otherwise Lattone, Dromad otherwise Dromadmoney, Meaghan, Dromconar otherwise Drumcannon otherwise Drumkenan otherwise Shentenagh otherwise Dromkonnan Drenkennan situate lying and being in Co Monaghan with the appurtenances etc…. WITNESS: Will CUTHBERT & Thomas ARMSTRONG both of the City of Dublin clerks to Henry BELAGH of the said City Gent. NOTE: These lands were initially left by Samuel JACKSON (1641-1706) of Dublin who was one of the Coleraine JACKSON brothers. There are two townlands that could be Ballymacombe: Ballymacombs Beg and Ballymacombs More. Rt Hon Richard JACKSON of Coleraine of 4th pt… land in High St Belfast. NOTE: This Richard JACKSON (aft 1729 - aft 1781) of Coleraine was the sole surviving son of William JACKSON and Frances EYRE. Richard JACKSON of Coleraine, Co Londonderry Esq to George HART of City of Dublin Esq… lands of Ballymadegan, Drumnaquil, Dunballycarne Ringrassbeg, Ringrassmore Ardaclave and upper and lower Altabreen NOTE: Because of echoes of these townlands in other deeds, I believe that this Richard JACKSON was the Richard JACKSON (aft 1729 - aft 1781) of Coleraine, the sole surviving son of William JACKSON and Frances EYRE. Ardaclave aka Ardaclaire Artaclave, Parish Dunboe, Barony Coleraine. Upper and lower Altabreen aka Altabrean, aka Altibrian, Parish Dunboe, Barony Coleraine. Richard JACKSON of Coleraine, Co Londonderry Esq to George HART of City of Dublin Esq. Reciting deed of release 7 Mar 1735 made btw William JACKSON then of Coleraine Esq. since deceased of 1st part, Frances his wife of the 2nd pt & the Hon Elizabeth MOORE then of City of Dublin widow and since deceased of the 3rd pt. William JACKSON died leaving Richard JACKSON his only son & heir who upon the death of this William JACKSON became entitled equity & mtg to Elizabeth MOORE invested in John McALLISTER of Coleraine in trust for Richard JACKSON and reciting that Henry HART late of the City of Dublin Esq since deceased on or about the 30th day Oct 1752 did lend and advance to Richard JACKSON the sum of 5,000 pounds re deed of release 9 Dec 1752 [secured against lands mentioned in previous deed #264872]. WITNESS Croasdale MOLONY & Michael MOLONY. NOTE: Because of echoes of these townlands in other deeds, I believe that this Richard JACKSON was the Richard JACKSON (aft 1729 - aft 1781) of Coleraine, the sole surviving son of William JACKSON and Frances EYRE. Clanchy [ow Landry], Ballynamony, upper Ballynamony, lower Ballynamony, , Enagh, Landhead, Drumskea, Correalleagh [or Carneally or Corneally], Collintaft [ow Collinla ow Collinlammy] Leekowlack, Ganaway [ow Ganaly ow Ganwaly] Ballynamavagh [ow Ballynamengh ow Harperstown] Carnanny [ow Carnany], Canreagh [owCarronreagh], Knocking [ow Knockren] upper Dovial [ow Dera], lower Dovia [ow Dera], Long Mullens, Broad Mullens, Cullefachan, Caigair, Scotch Craigs [ow Irish Craigs] Lary [ow Lacy] & Tullockers [ow the Eight Quarters [ow the Thirteen Quarters], Co. Antrim. Keelinarge [ow Kellencargill ow Kellincargatt ors Kellincrgitt ow Kellenargett ow Kellinorgett ors Silverwood] together with 5 acres pt of Tegnevan and a tenement in Lurgen called Bells tenement bounded by tenement leased to John PORTER on the one side of Derrybeg at the lower end & by tenement leased to John TURNER commonly called Thorn Treehouse on the other side containing about 5 score & 4 ft of front, together with gardens & houses, Co. Armagh. NOTE: This references an earlier Deed dated December 26, 1761. Btw James STEWART of Gracehill, Co Antrim Esq &of 1st part & Richard JACKSON of Coleraine Co Londonderry & Elizabeth JACKSON his wife and James JACKSON, eldest son & heir apparent of 2nd part & John GALT & Charles GALT of Londonderry merchants of 3rd pt…. in consid of £400 pd by GALT to JACKSON.. Tenement on the West side of the New Kow in Town of Coleraine marked in Map of said town #28… description of land… NOTE: Deed # 302317, where the same names are mentioned, makes me think that he was the Richard JACKSON who was a butcher. George JACKSON of Jacksons Hall, Co Londonderry Esq. Gent then of City of Dublin Esq of the 1 pt and Sir Henry HILL of the City of Derry Bt of the other.. Jackson did confer the dwelling house of Jackson Hall with all the offices houses gardens and pleasure ground thereunto containing 15 acres Plantation measure in Liberties of Colerain, Co. Londonderry with the use of all fixtures goods and furniture of every kind for yearly rent of 56 pounds… NOTE: This is George JACKSON (1776-1840) – one of Jacksons of Coleraine. Btw James STEWART of Gracehill Co Antrim Esq of 1st pt; Richard JACKSON of Coleraine & Elizabeth his wife and James JACKSON their eldest son of 2nd pt; John GALT & Charles GALT of Coleraine merchants of 3rd pt… released to James HUTCHINSON land on the west side of the New Road in Coleraine marked on the map of the said town as #28 with the land marked #63 and also the Gardener waste known by the name of Glovers Waste with all the houses Gardens Improvements in town of Coleraine WITNESS: James PARK of S of Pushbank and Richard JACKSON jr of Coleraine.. NOTE: Deed # 302317, where the same names are mentioned, makes me think that he was the Richard JACKSON who was a butcher. Btw Richard JACKSON of Coleraine, butcher of the 1 pt & John SMITH of Gillsboat, Co Londonderry, farmer of the other pt. Reciting that Elizabeth JACKSON wife of sd Richard JACKSON being entitled to an estate for life in a certain Tenement Situate on the West side of New [?] in the town of Coleraine with 11 acres of and by virtue of deed Hatton TETTLE deceased did that desire of Richard JACKSON and in order him to pay his Debts on an Engagement to a Trustee for her use.. 2 Nov 1793 James STEWART of Grace Hill of 1st pt. Richard JACKSON, Elizabeth his wife and James his eldest son of 2nd pt. John GALT of 3rd pt…. tenement on north side of brick lane in town of Coleraine cont in front 48 and in with 20 feet by lease from the Mayor Aldermen and Burgess of the Corporation of Coleraine dated 10 Jun 1773 for term of 48 years.. WITNESS: John PARKES att. Of City of Dublin, James JACKSON of Coleraine afsd butcher. NOTE: Jackson, Thos., aet. 105, butcher, at Coleraine 2 Feb 1793 . SOURCE: Index To The Births, Marriages, & Deaths: Antholologia Hibernica p. 160. NOTE: The will of a James JACKSON of Kirkland Kendal, Westmorland was probated Feb 20, 1820. Given the connections of the Coleraine JACKSONs to Westmorland, this is worth considering as a connection. Also, in a conveyance of Richard JACKSON of Kendal 16 June 1784, there is mention of his owning a butcher’s stand there in 1776. SOURCE: National Archives. WD RG/405/7 1784. There is more work needed on this line to determine wether there is a connection to the wealthier Coleraine JACKSONs who originated in Kirkby Lonsdale. Btw Lieut-Col George JACKSON formerly of Jackson Hall Co Londonderry but then of the City of London of the 1st pt. Thomas Knox HANNINGTON of Dungannon Co Tyrone of 2nd pt. James CAULFIELD of Cookstown Esq of 3rd pt … transfer of many lands. NOTE: This is George JACKSON (1776-1840) – one of Jacksons of Coleraine.